“Repair or replace” is the eternal debate many homeowners faced when their HVAC systems fail to maintain a comfortable temperature in their home. To make matters worse, this decision can be particularly difficult in an emergency when it is sweltering hot or frigid cold outside – which is common for Wisconsin weather. If you’re faced with this debate, the best solution is to speak with an expert from Jackson Hardware Heating & Air Conditioning – the leading specialist in HVAC repair and replacement in Jackson, Grafton, Cedarburg, Mequon, West Bend and all of Washington and Ozaukee counties. While each system is different, the right decision for your home ultimately depends on use in your individual household, the size of your home, and the number of people living in it – among many other factors. What is the age of your system? The average lifespan of an air conditioner, heat pump and furnace is 15 to 20 years. If the age if your unit is within these ranges, repair may be all that is needed in the foreseeable future. Is your system under performing? If your furnace or air conditioner is emitting excessive noise on start-up, you constantly need to adjust your thermostat, and your family is experiencing poor air quality – these are the signs it’s time for a new system. What is the size and capacity of your system? If you recently performed energy efficient upgrades to your home – such as installing new roofing, windows, or insulation – downgrading to a smaller unit will enhance comfort levels and reduce operating costs. Does your HVAC system operate on outdated technology? Technological advancements are occurring constantly: When you replace outdated equipment, you’ll get access to new features that can increase the efficiency of your system and lower your energy bills! What is your system’s environmental impact? 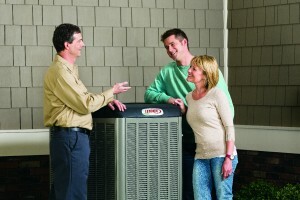 Your heating and cooling system constitutes up to 50% of your home’s total energy use. A new, ENERGY STAR qualified unit will ensure that your system meets or exceeds the national standards for energy efficiency. What is the prospected cost of repairs? A system is typically replaced when the cost of repairs exceeds 30% of the cost of a new unit. Please inquire about our current promotions or see our Online Specials page to save on your upcoming repair or installation. Are you eligible for tax credits? Installing a high-efficiency system may qualify you for a Lennox rebate, state rebate and federal rebates or tax credits. Are you eligible for utility rebates? High-efficiency systems also qualify homeowners for one-time rebates as well as monthly utility savings. How long will the installation/repair take? Contact our HVAC repair and replacement specialists at (262) 677-3477 to get answers to all your questions. No matter what time of day you call, you’ll always speak with a live person at Jackson Hardware Heating & Air Conditioning. When you need HVAC repair or replacement in Jackson and surrounding areas, contact Jackson Hardware Heating & Air Conditioning today!